Despite opening a little higher (intra high 14.53) the VIX cooled right from the open. With equities building gains across the day, the VIX was ground significantly lower, settling -9.8% @ 12.73. 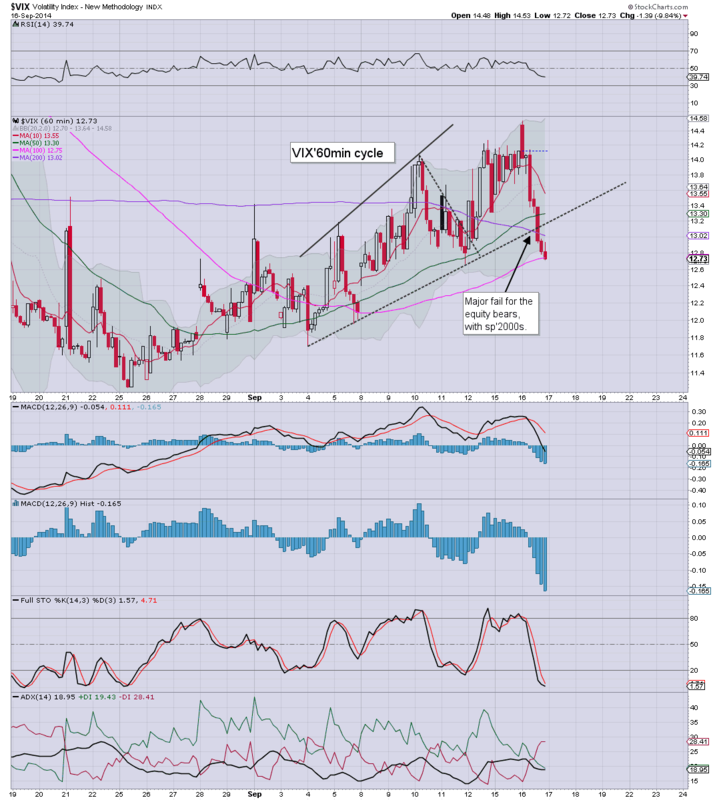 Near term outlook is for VIX to broadly slip lower into the weekend. 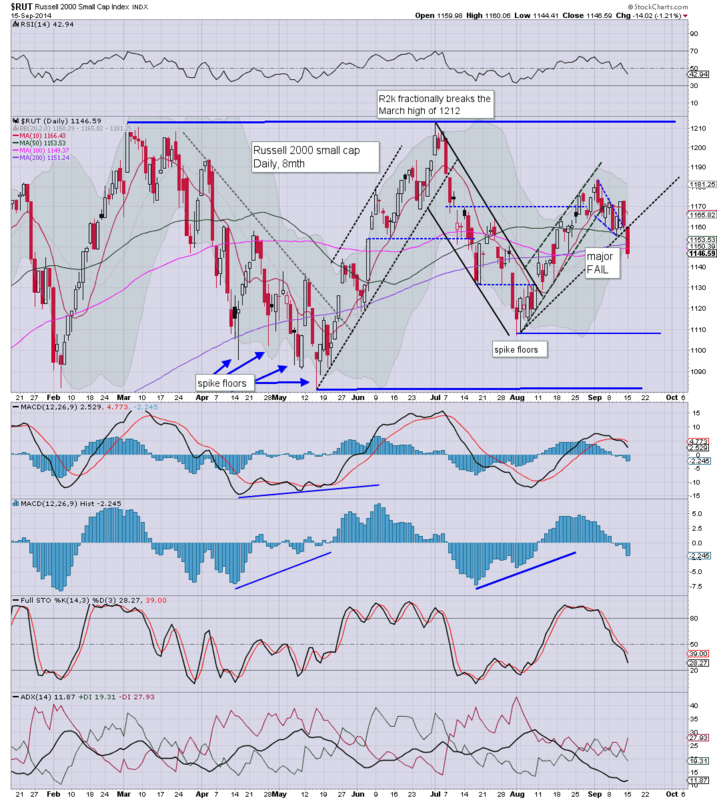 *the gap zone in the 15s now looks out of range, since the low sp'1970s no longer look viable. Today was a rather classic instance where the VIX opened higher, but immediately the smaller 5/15/60min candle turned black - a real warning sign to the equity bears to 'make a run for it'. All things considered, VIX might spike a little tomorrow afternoon with the FOMC...but I no longer expect the 15s. US equity indexes closed moderately higher, sp +14pts @ 1998 (intra high 2002). The two leaders - Trans/R2K, settled higher by 0.6% and 0.4% respectively. 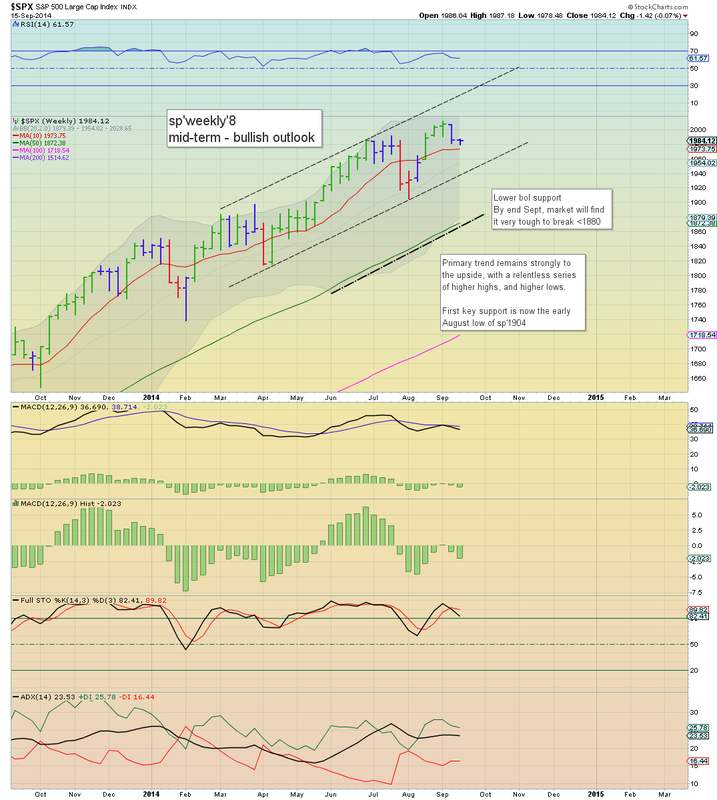 With the break of trend/resistance, the market looks set for broad upside into next week. We opened a little lower, but right from the start, the VIX started to cool - with the candle turning black..and the equity indexes started to claw higher - with hollow red reversal AND spike-floor candles. There were certainly a lot of things working against the bears today.. even from a pure cyclical basis, the hourly MACD cycle was battling higher. All things considered, perhaps a minor snap tomorrow - whether on the FOMC announcement or after the Yellen press conference. Regardless, the recent low of sp'1978 should comfortably hold. I won't be short until we're at least in the 2030/50 zone. Further, I will consider adding another long-index block.. on any pull back.. whether tomorrow.. or later in the week. Rather than another day of minor weak chop, US equities are set to close moderately higher - but well above the old trend/resistance of 1990. VIX looks set to have maxed out at 14.53... whilst the Dow has already broken a new historic high. ...somewhat bizarre day... but the opening candles were a clear warning for bears to make a run for it. It would seem sp'1978 is as low as we go. Sure, we might briefly snap lower tomorrow, but it won't likely be under 1980. *I hold a small long-index block (from 1991 last week)... will seek to pick up a large index-long on the next hourly cycle pull back....whether tomorrow.. or Thur/Friday. 3.17pm.. Price structure on the smaller 15/60min cycle is a baby bull flag. 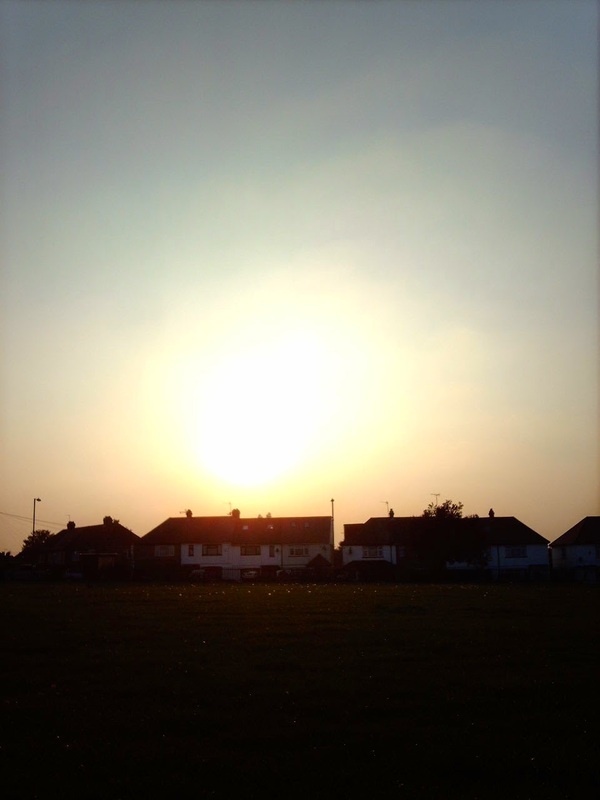 It bodes for sp'2010/12 sometime tomorrow. Certainly, I see ZERO sense in anyone trying to short this madness, not least ahead of the Fed, when we know what is coming (QE taper'7) anyway! A number of factors have contributed to today's climb back into the sp'2000s... but regardless of those... price action/structure are back to very bullish conditions. 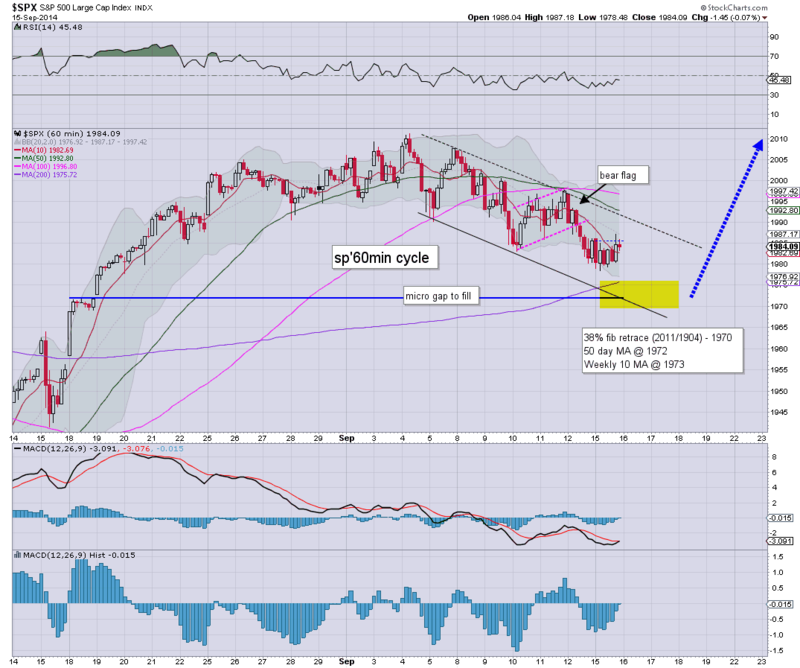 Daily cycle is offering 2010 in the immediate term... weekly cycles offer 2030. *notable new historic high on the Dow. ..even to me... this is starting to get kinda stupid..not least being a mere day ahead of the FOMC announcement. The equity market continues to build gains, and is (disturbingly) already close to breaking back above the giant sp'2000 threshold. With the daily cycles turning back upward... equity bears look to be.... toast. Seen on the small 15min cycle, you can see a rather powerful reversal candle...with a very clear spike-floor. When you consider the opening black-fail candle on the VIX, this is just another classic example of why I do try to be VERY mindful of such candles. They can be very important signs. A daily close in the sp'2000s is clearly viable. 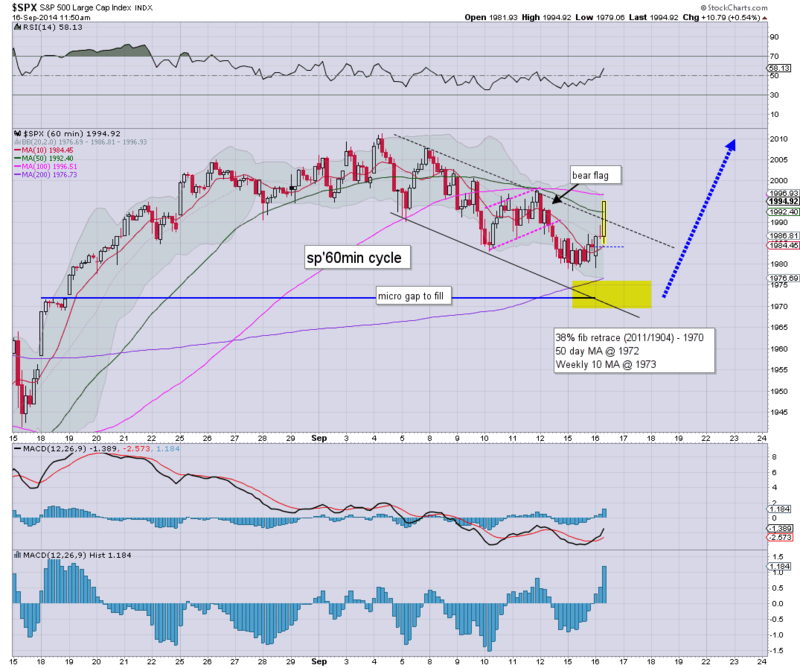 Daily cycle offers 2010 in the immediate time frame... weekly cycles offer 2030s in the near term. 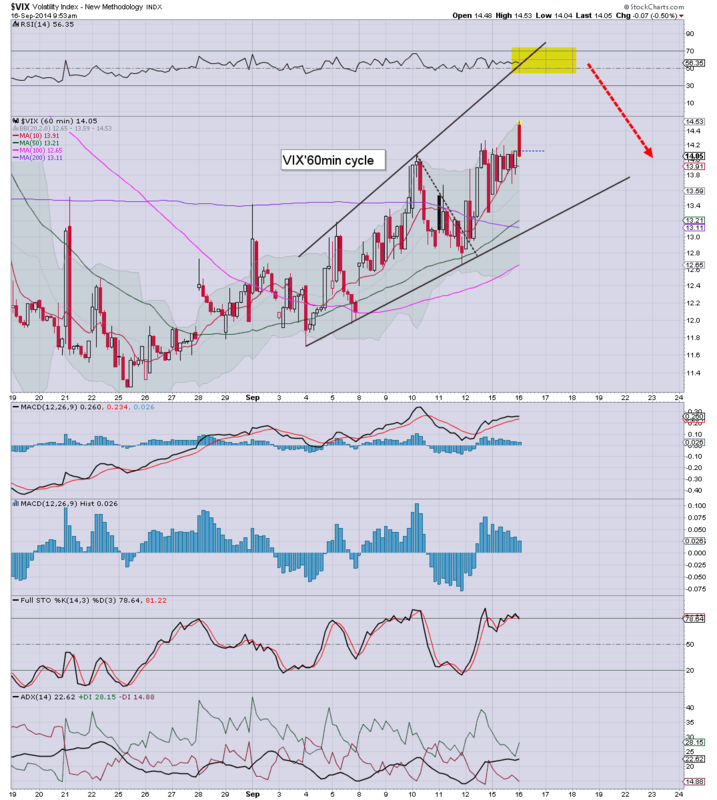 As much as I don't like to note it, the low sp'1970s now look... unlikely.. it would seem we have a key floor of 1978... with VIX @ 14.53. Yes.. we have the FOMC tomorrow..and that might see a 'brief' drop... but I sure don't expect the 1960s. time for a walk... I need some sun. With the break back into the sp'1990s, the bears have lost what moderate control they had. 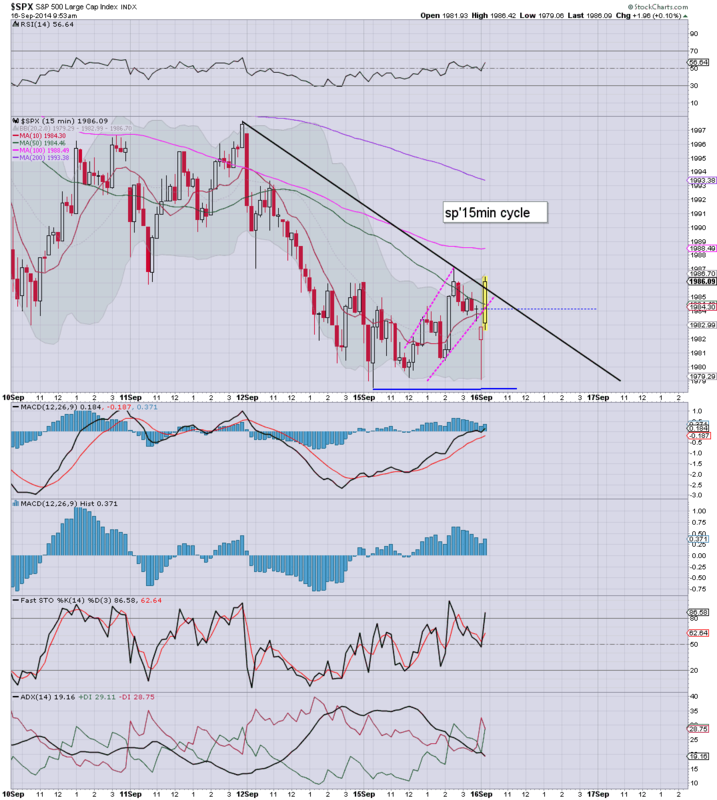 Market is (arguably) on the rise for cyclical reasons.. with the $2bn of QE-pomo no doubt helping. Oil is notably higher, +1.9%. 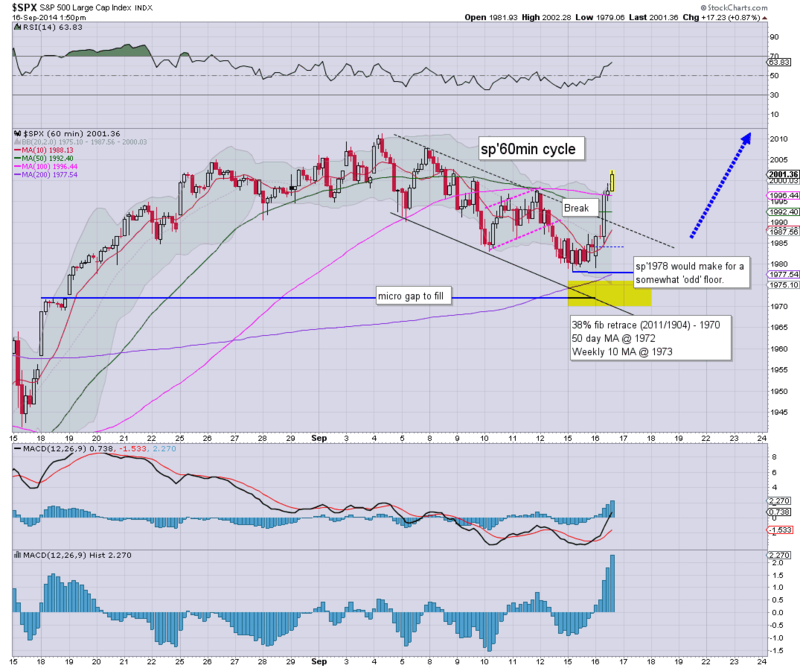 *note the daily MACD (blue bar histogram) cycle, it is levelling out..and is offering 5-7 days to the upside. With the break of upper channel/trend resistance... now its a case of 'how high'. Obvious target is the giant 2000 threshold. 12.23pm.. gains holding.. sp'1997...and the giant 2000 threshold is now viable this afternoon. Smaller equity cycles are getting over-stretched....but still.. .a break above trend is VERY important to recognise. 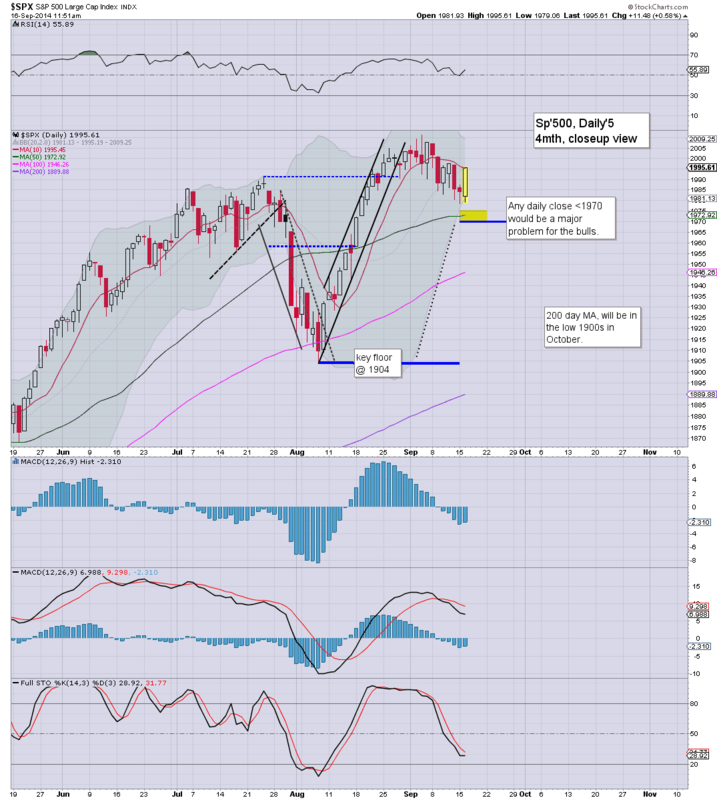 Despite the opening reversal from sp'1979 to 1989, the near term trend remains much the same.. slow downside crawl. There seems little reason why sp'1978 will be a key floor... primary downside target remains the 1973/70 zone... with VIX 15s. ..again, its pretty tedious. The price action is relatively minor. Price structure is a rather clear very large bull flag.. and whether you want to call it a wave'2.. B... or whatever.... the bears remain WEAK. So...its morning turn time... a problem remains $2bn of QE today. I'm still guessing we hit the low sp'1970s...but it sure is taking its time to get there. 11.31am.. ohoh... bull maniacs punching higher... sp'1991.. and its on the edge of breaking the down trend. 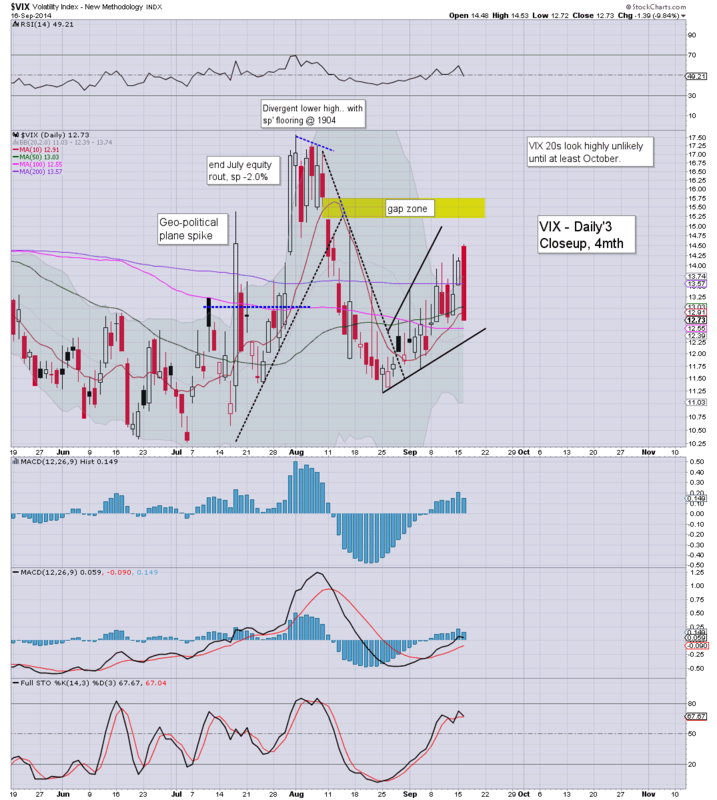 VIX -3.2%.... but after the opening black-fail candle..not entirely surprising. The equity bears have failed from the open, with equities turning positive, and a very clear black-fail candle on the VIX hourly cycle. However, sp'1978 does not make for a good floor, and renewed downside still seems a given.. whether later today or (FOMC) tomorrow. No doubt some bears are starting to throw bricks at their screens. ....even to me.. this is damn annoying. Notable strength: DRYS +5%.... although that is after some recent weakness. 10.39am.. still holding (just) within the broader down trend... but still.. a messy open.. again. Good morning. Futures are a touch lower, sp -3pts, we're set to open at 1981. Metals are trying to bounce, Gold +$3. 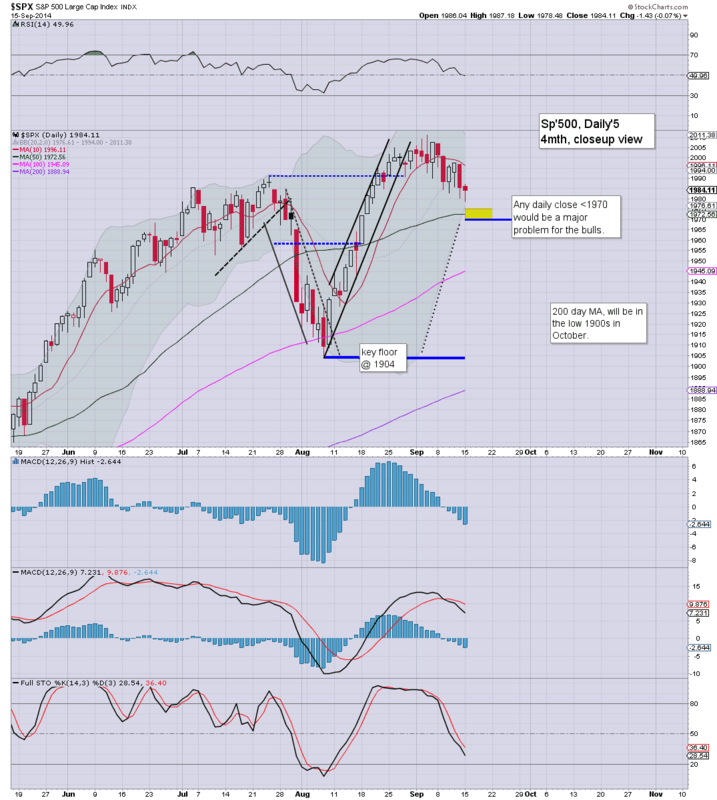 Primary downside target zone remains sp'1973/70, which should equate (briefly) to VIX in the 15s. A problem for the bears is $2bn or so of QE-pomo... but as ever... the selling might be enough to negate this relatively minor amount of QE fuel. Notable weakness: NFLX -1.8%... following on from yesterdays severe weakness in momo-land. 9.35am.. It remains depressing how weak the bears are. Even holding a decline of sp' -4pts is tough. Regardless...a typical morning turn is around 11am... lets see if we're low 1970s then. VIX 14.40s... won't take much to hit 15s. 9.37am.. Opening black candle on the VIX..... reversal on the equity indexes. ..really...really lame... when you consider there is $2bn of QE fuel this morning. The week began with a rather tedious day of minor chop for the main market - despite some notable weakness in the R2K/momo stocks. The best the bears have managed across the last few weeks is an embarrassing -1.6% decline. So.... a second blue candle. 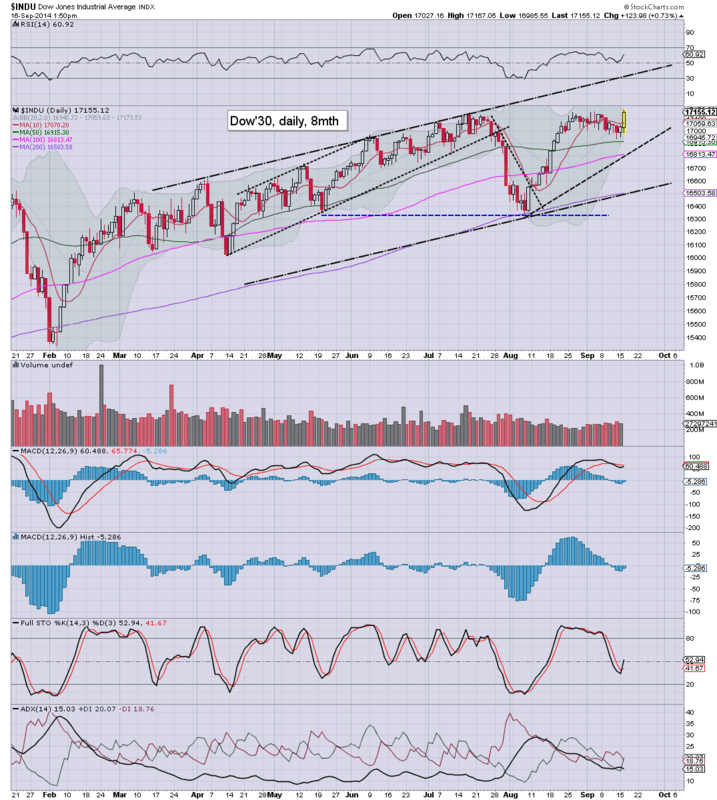 For those doomer bears out there who think sp'2011 is a key top... the second blue candle is indeed something to get marginally curious about. All things considered though, price structure on the daily charts is arguably bullish, and a move from 2011 to 1970 would still only qualify as 'embarrassingly lame'. Interesting discussion.. well worth giving some time to. Not much is due tomorrow, just the PPI. Market will sway its attention to the Fed, as it begins its meeting, but then... we know what the announcement will be. 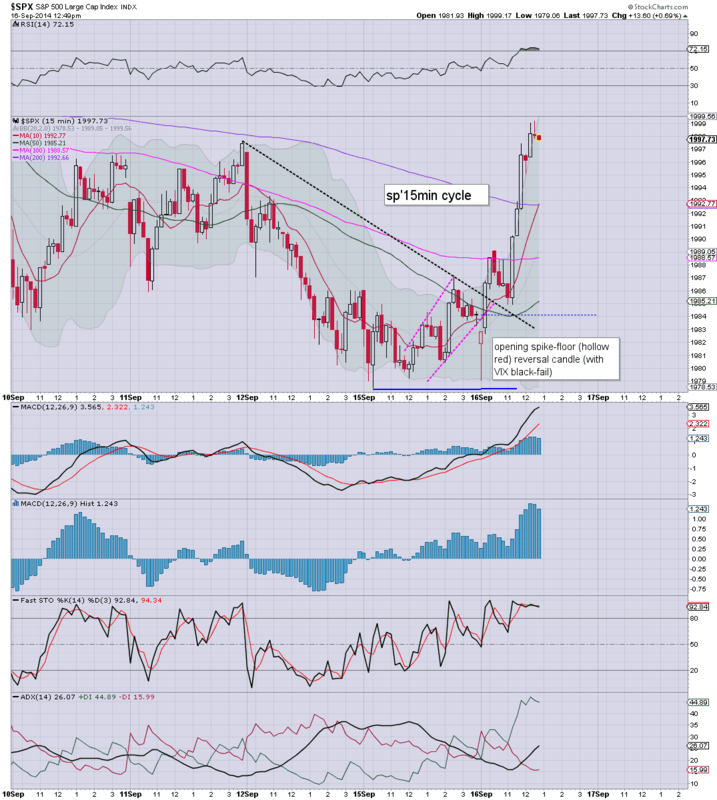 *there is sig' QE of $2-2.5bn....bears beware! 2. Download a FULL copy of Thunderbird... do not use OLD version. 4. ALL old emails AND folders should re-appear.. although you might need to re-enter passwords for individual accounts. Personally, I continue to have an intense love and hate relationship with technology. It sure offers the most amazing opportunities, but when it doesn't work, and there are a near infinite reasons 'why' it might have stopped working, well, that is when I almost long for the days pre-internet. US equity indexes closed somewhat mixed, sp -1pt @ 1984 (intra low 1978). The two leaders - Trans/R2K, settled -0.4% and -1.2% respectively. 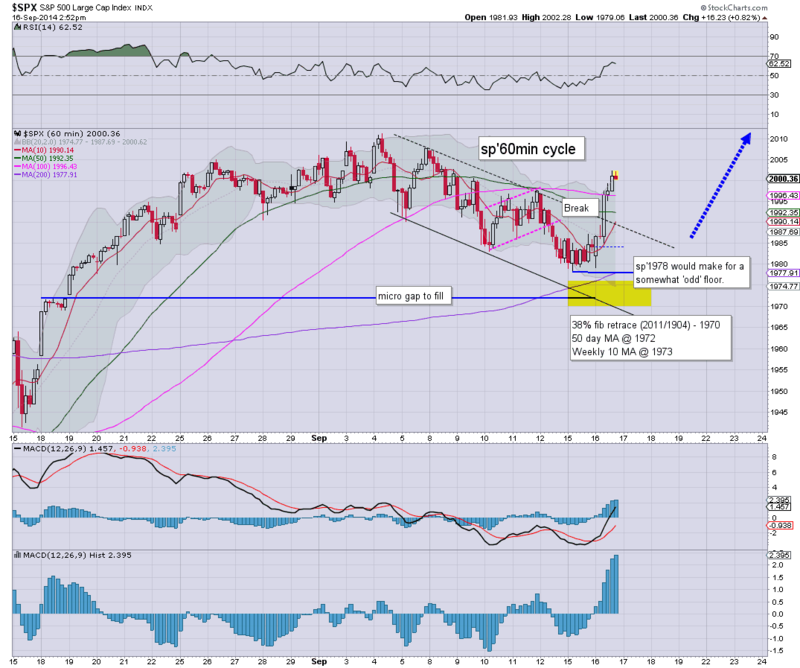 Near term outlook offers the low sp'1970s, before renewed upside into October. Suffice to say, there was some real disparity between the main indexes today. At one point, we had the Dow fractionally higher, whilst the R2K was lower by a rather significant -1.4%. 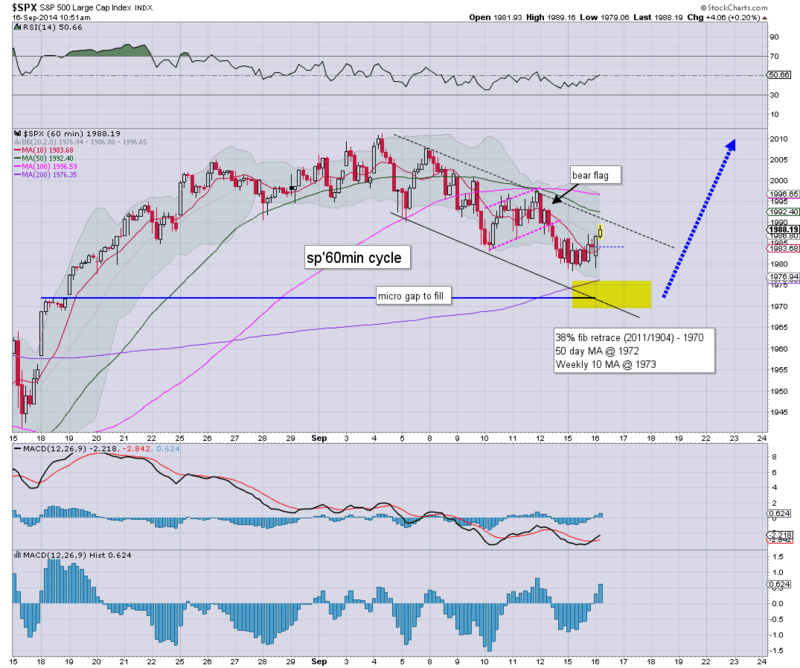 Broader outlook remains bullish, so long as the 1970s hold.